With Uruguay breezing through Group A, and with Portugal failing to beat Iran on the final matchday, Uruguay faced off against Portugal in the Round of 16. It was a match of two defensive stalwarts, as Óscar Tabárez’s La Celeste, which had conceded zero goals throughout the entire group stage, took on Fernando Santos’ Portugal, whose defensive cohesion had seen them win the Euros just two years prior. Cristiano Ronaldo went up against two familiar foes in Diego Godín and José Giménez, and two footballing heavyweights competed for a berth in the quarterfinals. While many expected Uruguay to start with a 4-4-2 in possession, their on-the-ball shape varied from a 4-3-1-2 to a 4-3-3, depending on Nahitan Nández’s position. This positional structure saw Uruguay pack the center of the pitch, while often overloading Portugal’s fullbacks and leaving them exposed. Later on in the game, Uruguay adjusted to the 4-4-2 while defending deep, giving them greater access to the wings and facilitating quicker counter-attacks. Portugal aimed to work around Uruguay’s midfield block with quick, short passes through the wings, and then tried to switch play from one side to another. Setting up in a 4-4-2, their narrow midfield worked in Uruguay’s favor. With Bernardo Silva and João Mário tucking into midfield, they were constantly absorbed into Uruguay’s central overload., and Mário tucking inwards often let left back Raphaël Guerreiro exposed on the counter. For the first time in the tournament, Fernando Santos decided to start Ricardo Pereira over first-choice right back Cédric Soares, and it paid off. Ricardo was constantly active going forward, a much-needed jolt of creative energy in contrast to Cédric’s conservative nature. His forward runs allowed more space for Bernardo, who was Portugal’s best performer on the day. While Cédric’s heroic performances helped Portugal to glory in 2016, with his underwhelming club form for Southampton, and with the likes of Nélson Semedo and João Cancelo rising through on Champions League sides, his days as Portugal’s starting right back may be numbered. 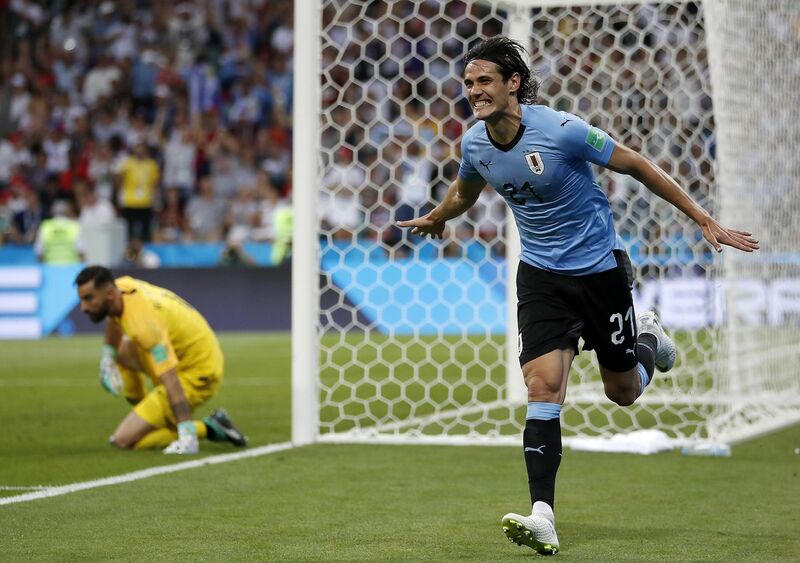 In this match, we saw one of the greatest individual performances of the World Cup from Edinson Cavani. While he would miss the quarterfinal against France, he gave it all in the 74 minutes he was on the pitch, before limping off with a calf injury. Cavani scored two goals on two shots on target, linking up with Luis Suárez to cause Portugal danger, while also being tireless as usual in defending. It’s no secret that Uruguay’s defense is unparalleled in international football; their low-block defending brings up memories of Diego Simeone’s Atlético Madrid or Helenio Herrera’s Inter Milan. Every man fights to preserve Uruguay’s defensive shape, and this starts from the top. Suárez and Cavani fiercely pressed the Portugal center backs, while Rodrigo Bentancur and Nández both worked to prevent William Carvalho from having too much liberty on the ball. As Portugal attempted to switch the ball around the sides, Cavani and Suárez worked tirelessly to shift over to the wings and take away the passing option. To make up for Uruguay’s natural lack of wingers, the two center forwards positioned themselves in wide areas for counter-attacks, stretching Pepe and José Fonte apart from each other, leaving acres of space in the middle, and allowing direct passing options for quick counters. The tandem of Suárez and Cavani worked perfectly, with El Pistolero dropping deep to lay off the ball as El Matador shifted wide into space. Uruguay’s 4-3-1-2 shape absorbed pressure and worked perfectly to nullify Portugal, who had no natural wingers. Gonçalo Guedes, a quick wide forward, played as a second striker. After a sloppy start, Guedes became more effective when Ricardo Quaresma entered for Adrien Silva. Adrien took up too much space in the middle, often limiting Bernardo’s space to roam infield, but after this positive change, Quaresma and Guedes occupied the wings, with Bernardo-William-Mário as the central three in the 4-5-1. Guedes finally started to do well, up against Martín Cáceres, who had been a rock against Mário and Guerreiro. Portugal threatened with this newfound width, yet Santos undid this positive change nine minutes later, hooking Guedes for André Silva. While Tábarez’s well-planned tactics saw Uruguay control the game in their favor, Uruguay’s individual performers carried out his tactics admirably, and they deserve as much credit as the coach for the result. Diego Godín helped marshal the defense, and alongside his club partner, he helped divert cross after cross as Portugal turned desperate in their search for an equalizer. Portugal failed to penetrate Uruguay’s midfield block with central passes, instead looking to find success on the wings. They tended to circulate possession from side the side, which usually amounted to nothing but a lukewarm cross, which would then be cleared with ease. Uruguay aimed tirelessly to reduce the quality of Portugal’s crosses, which often saw two players focus on a Portugal player, cutting down both space and time. Despite only having 34% possession and three shots on target, Uruguay dominated the game and were thoroughly superior to Portugal. One must wonder if the quarterfinal result versus France would have been different had Uruguay had Cavani fit and ready, but nonetheless, the tireless and heroic display from Los Charrúas will live on in memory.